VOA’s John Tanza contributed to this report. The new leader of Sudan’s transitional military council said Saturday he is committed to transferring power to a civilian government within two years and that a night curfew had been canceled. Lieutenant General Abdel-Fattah Burhan made the announcements during his first televised address, when he also ordered the release of all prisoners jailed under emergency laws ordered by ousted president Omar al-Bashir. The moves are the latest indications that pro-democracy demonstrations are weakening the military’s influence in the oil-rich country. The announcements came after Sudanese intelligence chief Salah Abdallah Mohamed Saleh resigned Saturday, one day after the defense minister quit following the military’s overthrow of the president. The council issued a statement saying its leader, Abdel Fattah al-Burhan, accepted the resignation of Saleh, commonly known as Salah Gosh. Gosh led the feared National Intelligence and Security Service and oversaw the agency’s brutal crackdown on protestors who participated in four months of sometimes deadly demonstrations that led to Thursday’s military’s ouster of al-Bashir. 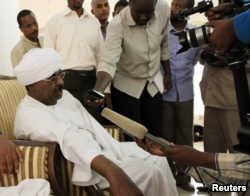 Sudanese intelligence chief Salah Abdallah Mohamed Saleh, also known as Salah Gosh, talks to the media in Khartoum, Sudan, July 10, 2013. Salah Gosh resigned from his post Saturday. Defense Minister Major General Awad Mohamed Ahmed Ibn Auf stepped down Friday as the head of the transitional military council after serving only one day in the position. Ibn Auf made the announcement as demonstrators called for faster end to autocratic rule and worsening economic conditions. Ibn Auf appointed as his successor Lieutenant General Burhan, who previously served as inspector general of the armed forces. The military council, which says it will rule Sudan for up to two years until elections are held, did not say why the resignations occurred. The protestors have said demonstrations would continue until a civilian transitional council is formed, fearing the military will rule indefinitely. 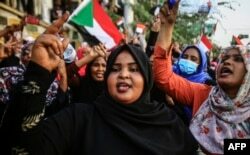 The Sudanese Professionals Association, which has led demands for a civilian government, called for more protests on Saturday. Another top general, Omar Zein Abedeen, said at a news conference Friday that military authorities will not extradite al-Bashir, who is wanted by the International Criminal Court to face charges of war crimes, crimes against humanity, and genocide. Sudanese women chant slogans during a demonstration demanding a civilian body to lead the transition to democracy, outside the army headquarters in the Sudanese capital Khartoum on April 12, 2019. Since al-Bashir’s ouster two days ago, 16 people have been killed in anti-government protests, according to Sudanese activists. 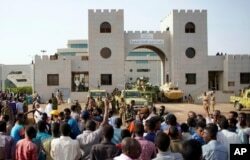 The Sudan Doctor’s Committee, an affiliate of the Sudanese Professionals Association, said Saturday 13 people were fatally shot Thursday and a soldier and two others were killed Friday. Sudan has lost significant oil revenue in recent years, and its currency has deteriorated in value. Inflation has soared as high as 70 percent, and the government slashed subsidies for fuel and bread. Sudanese demonstrators gather to protest against the army’s announcement that President Omar al-Bashir would be replaced by a military-led transitional council, outside the Defense Ministry in Khartoum, Sudan, April 12, 2019. Washington, meanwhile, is urging Sudan’s new leaders to hand over power to civilians in less than two years, and the European Union called for a “swift” transfer to civilian rule.